EDITED: Hi all - thanks for catching a mistake on the table. Looks like I made a typo and copied the wrong column over. As such the statistics have been updated. 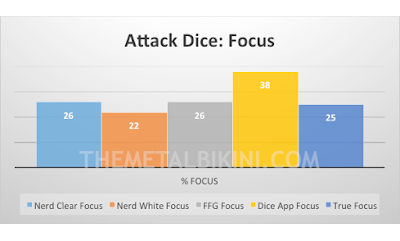 The change is the attack dice focus result on the FFG Dice App was not different than all other results, however, the attack dice blank result returned a similar trend as the evade dice but was only different from true probability and Nerd-X White attack dice. Please keep in mind that this is a low sample size, as such if you have beef with it (as many of you have stated) I would refer to this article that discusses power of sample sizes. To summarize for you in order to determine if a dice is fair or not you will only need to roll the dice 30x to reach 95% confidence in your outcomes based off a power of 0.80 (common power model). As we used statistical test based on this model we arrived at statistical probability. Does this mean it is 100% accurate, not in the least. This is one study with one low sample size. 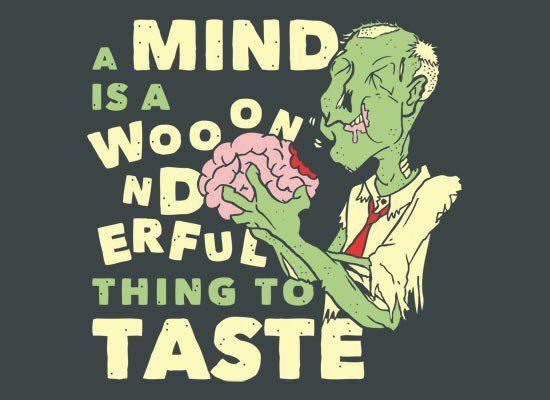 Take it for what it is worth or not, either way you are welcome to replicate the experiment and test it for yourself. Welcome back nerds and nerdettes! If you are just joining us, we have been discussing the use of third-party dice in X-Wing while simultaneously reviewing some high quality third-party dice from Nerd-X. Our most recent post (Dice Hate Part I) recently broke the internet and warped the minds of many X-Wingers. In short, the X-Wing community does feel that third-party dice should not be legal (so does FFG per the official ruling of "hell no") in tournament play. As such, we (aka Jeb, Thomas, and I) fellow slaves of the faithful (aka TMB readers, X-Wing aficionados, haters, and lovers) sought out to determine if third-party dice roll differently than standard FFG dice. Moreover, we included the dreaded FFG Dice App for comparison as it has been brought up in the discussions since last week and adds an interesting layer to our science experiment. Brace yourself for what you are about to learn and please refrain from throwing things at your computer screens and smart phones (or not, as I do not really care because the files are in the computer). Three dice from each category (Nerd-X Clear, Nerd-X White, FFG, and FFG Dice App) were rolled 50 times for a total of 150 dice rolls per set. 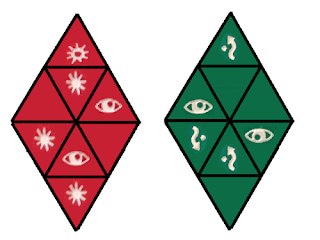 Each symbol was recorded for attack dice (hit, critical hit, focus, blank) and evade dice (evade, focus, blank) and further analyzed. These raw symbol recordings were converted to percentages (raw symbol result/50 = calculated percentage of symbol rolled) for each dice. From the calculated percentages an average and standard deviation was conducted across each dice type and set (e.g. [Nerd-X Clear 1 + Nerd-X Clear 2 + Nerd-X Clear 3]/3). The average calculated percentages of each dice were compared to one another using a Pearson's Chi-Squared test to determine if the proportion of one dice type is statistically different from another dice type (e.g. is Nerd-X Clear's average calculated percentage different than FFG's average calculated percentage?). In addition, each average calculated percentage was compared to the theoretical true dice probability (Table 1). 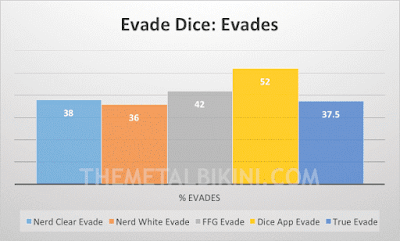 The probability of rolling an evade result on the FFG Dice App (52%) was significantly higher than true probability (37.5%) and all other dice percentage outcomes (Table 1). In addition, the probability of rolling a blank result on the FFG Dice App (26%) was significantly lower than true probability (37.5%) and all other dice percentage outcomes (Table 1). No significant difference was observed between true probability and all dice percentages for the focus dice result. The probability of rolling a critical result on the FFG Dice App (24%) was significantly higher than true probability (12.5%) and all other dice percentage outcomes (Table 1) (yes you heard me correctly - start panicking). 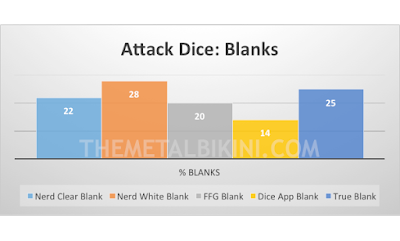 In addition, the probability of rolling a blank result on the FFG Dice App (14%) was significantly lower than true probability (25%) and the Nerd-X White dice (28%) (Table 1). 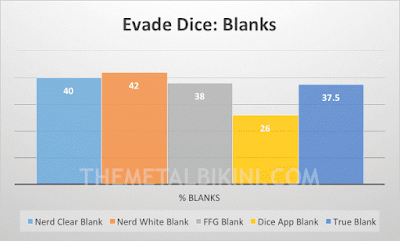 No significant difference was observed between true probability and all dice percentages for the blank dice result. 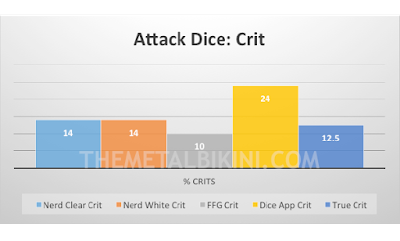 The Nerd-X dice (clear and white) and FFG dice are not different than one another or true dice probabilities. 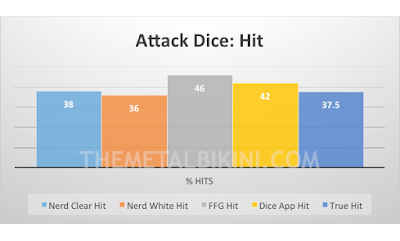 However, the FFG Dice App was different on numerous results (higher probability for evade, and critical hit; lower probability of rolling blank results on both evade and attack dice) (See Figures 1-7) when compared to the Nerd-X dice (clear and white), FFG dice, and true dice probabilities. 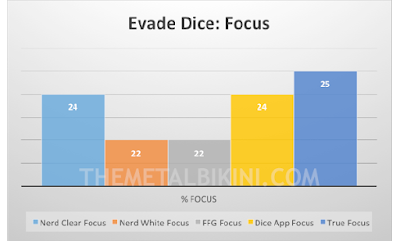 Figure 3: Evade Dice Evades Results: Hey! Did you know you can click for a larger version? Figure 5: Attack Dice Critical Hit Results: Use the mouse Luke and click for a larger version. Figure 7: Attack Dice Blank Results: Wow! Death by charts. If you haven't figure it out by now, you can click here and the image gets bigger. 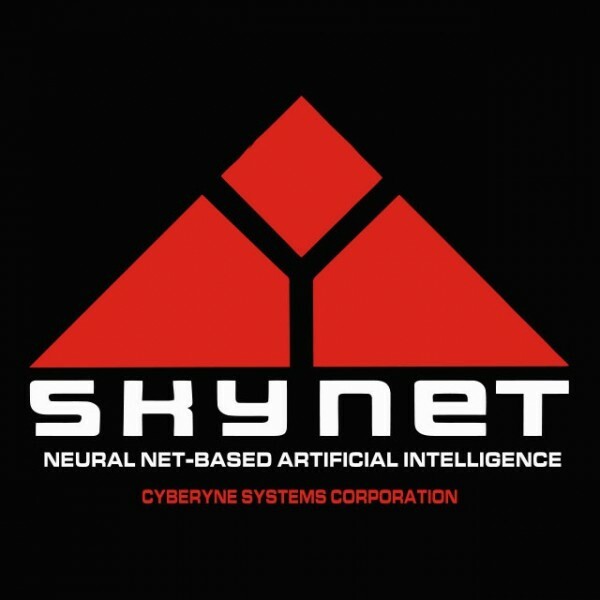 Overall, I have arrived at the following conclusion: the FFG Dice App is SkyNet. But seriously, these results are a bit shocking. In fact, I was so shocked that I rolled the FFG Dice App for a second time on a second device. I ended up with the same results with some minor changes (slight reduction in evade rolls down to 51% but still rather high). With this knowledge, I looked back at all of those games that I have played people who used the FFG Dice App (cough cough Thomas). They always seemed rather lucky to roll 3 natural evades (no modifiers required to alter results) at range one of my Fat Han or blast me with 3 crits at range three of my Poe. Now it seems like the science suggests (never proves, as nothing is perfect in science) that the FFG Dice App might be a bit biased and off. Alas, this is only one experiment. One positive finding of this little research study is that the Nerd-X dice are not different than true probability or standard FFG dice. In fact, they even seem closer to true probability than standard FFG dice. Props again for making high quality dice that are fancy and accurate. To be fair, it is possible when rolling these dice that we happened to get lucky from time to time. However, this shouldn't sway the results this drastically. There could be human error involved such as different roll strategies or error from the rolling surface could influence the results. Yet we tested this assumption and rolled dice on the FFG mats and a standard wooden table and didn't see any noticeable changes. In the end, it is clear that if my opponent pulls out the FFG Dice App I will violently shake my fists in rage, flip tables, and fart in their general direction. But seriously, I will either ask them to roll other dice or pull out my own FFG Dice App and rain down my hatred of 10,000 years on them in the form of Critical Hits and Evades for days. Think we are wrong? Let us know! We welcome your observations and data on this. In fact, if you are interested in adding to our sample size please repeat our experiment and send us your results. I am very curious to see what everyone comes up with. On a random side note - FFG if you are listening you had better give us a cut from the millions of dollars you will receive from X-Wingers who will download the FFG Dice App after this article breaks the internet. 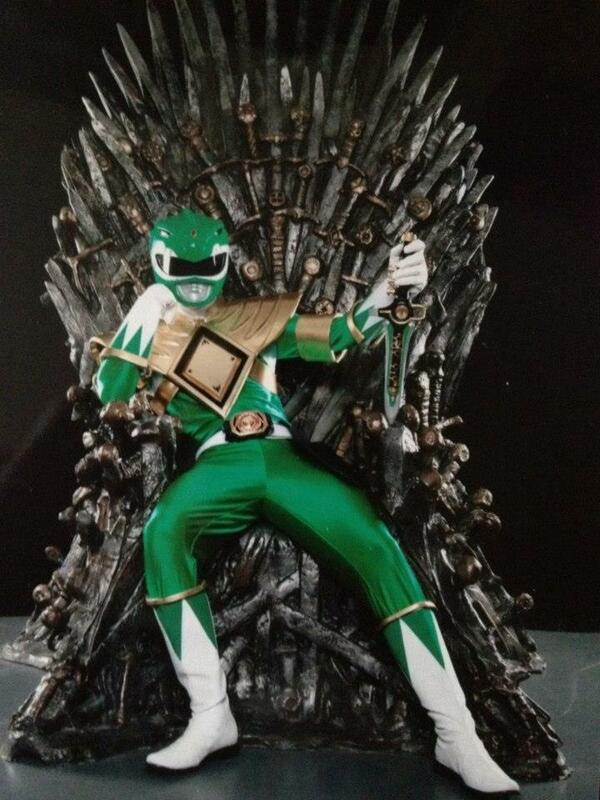 With that, I say goodbye, goodbye, and good riddance to bad luck. It has been a decent amount of time since we have posted an article and I take full responsibility. The whole tenure process made me insanely busy during the last few months as I attempt to move up the academic ladder. Recently, we had the opportunity to review some custom made dice from Nerd-X (our fellow friendly nerds that make awesome x-wing custom stuff from Germany). They arrived about two weeks ago and we have been play testing the heck out of them! Not only are they pretty awesome looking, they have a bit of a different feel than the normal FFG dice. That could be because they don't have grimy sweat and tears on them from space battles lost or dirt from being flung onto the floor after rolling blanks. The edges are a bit more rounded than FFG dice, they are pristine in clarity and without any internal flaws. I wish I had some of the championship transparent dice to compare to but alas I am not one of the 10 across the world that have them. The white dice are superb and really stand out on the table with all the same qualities as the transparent dice (minus the whole transparency business). The painted symbols are pristine and stand out. I even tried to rub off one of the symbols with a blade and alas no wear and tear! Solid craftsmanship for sure! Overall we have received tons of positive comments and interest from our local players regarding both sets of dice. In ever growing community of third-party X-Wing accessories, it can be difficult to find this high of quality work. In the end we have had fun playing with our nifty new sets of dice and it has helped some of us stand out (ehhhhhmmmm Jeb) when our flying was a bit on the lacking side. After spending a few games playing with some folks and receiving some question from our readers, the overall question that was brought up was are the dice legal in tournament play. "As a TO I will never allow third party dice. The risk of controversy is to big. As a player I would request that we use an official set of dice as well." "The specific dice shown here also has the issue of breaking trademark. 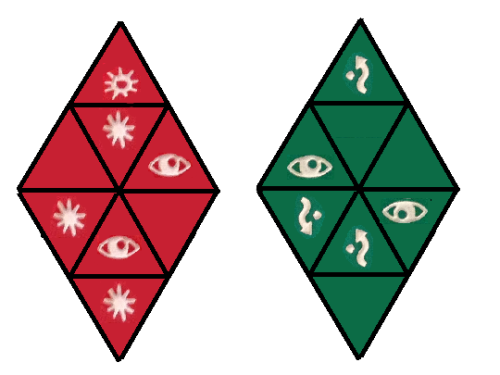 The symbols are a direct copy of FFGs which I think is very poor form by the seller/manefacturer"
"They looks great, but pretty sure FFG ruled against the use of third party dice in competitive play as well." "I use mine at my local, everyone knows they're 3rd party with no complaints." "My deal with the dice is that it's not allowed in the rules for all levels of play. 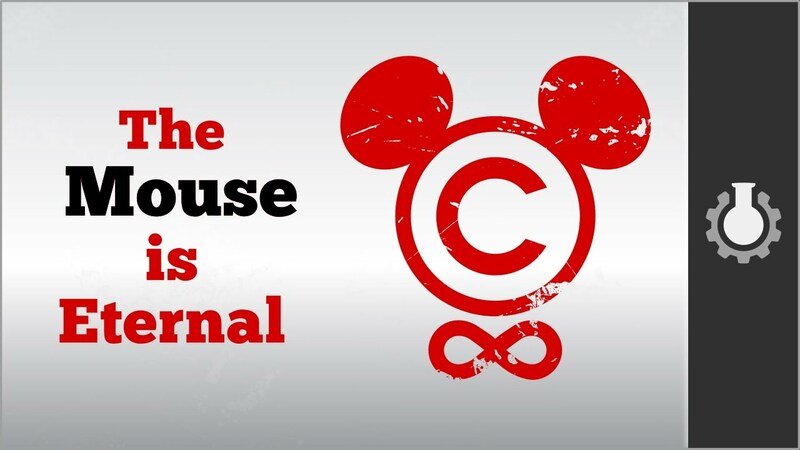 If you read that and ignore it, what other rules are you willing to break?" " I don't like them because they are clearly trying to mimic the official ones, so it's begging to have counterfeit dice being sold on third party sites." 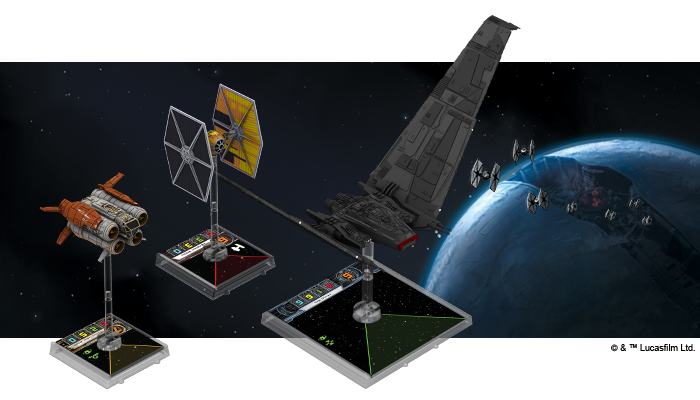 "Dice are included in the start boxes and tokens with the ships. It's mostly irritating and confusing with all these 3rd party tokens. I don't think any non-FFG items should be allowed. No 3D printed ships, no proxy cards, no fake dice and no confusing tokens." "No one is even mentioned the dice app that FFG has put out. According FFG it's a legal way to roll dice. My personal opinion, I would ban it form tournament play over aftermarket dice"
"I am 100% for this. As a tabletop RPG player for 20 years I have amassed a huge dice collection and I know these will be awesome and roll just the same as FFG's. Literally the only reason to not allow them is at a function where FFG could not allow third party merch. I plan to buy and use extensively." "Aren't the symbols on the dice copywrited? Disney are usually quick on these kind of things..."
"We're all hardwired to see patterns and seek logical explanations, even when things are completely random"
" I think whether or not I allowed my opponent to use them in a tourney situation would depend on whether I knew my opponent." "Do the dice roll the same results??" Apparently, custom dice are rather controversial. The comments and thoughts continue on and on and on and on. Yet it would seem the main themes that emerged were folks liked them but wouldn't allow them for fear of a potentially rigged dice and that FFG forbid them from play. "If a player uses the Star Wars™ Dice App, the device with the app must be displayed in full view of both players at all times, and their opponent may request to share the app"
In true non-Frank like fashion (eh? eh?? joke anyone??) FFG rules against the use of them. As such I cannot see much room around that ruling. Overall, third-party tokens, dice, and templates are really works of art (these Nerd-X dice are for sure) and I applaud people who make them and produce them. I for one have zero skill at art and I find it astounding what folks come up, so all you third-party artists keep up the good work and ignore the haters (haters gonna hate y'all). The last thing I wanted to mention was a question thrown my direction after having some extreme luck with my new dice. This is a difficult to answer without some science, however, you are in luck as I happen to be one (a neuroscientist to be exact). As such, in our follow up article we will approach the dice from scientific perspective to answer this burning question. Hold onto your butts---this will be a fun ride y'all. Until then stay frosty and please keep bickering and arguing about X-Wing stuff on social media and the like. In fact, feel free to argue with us if you have a different perspective. I just want to say that I am Super, Super, Super Excited for this !!!!!!!!!!!!!!!!!!!!!!!!!!!!!!!!! !